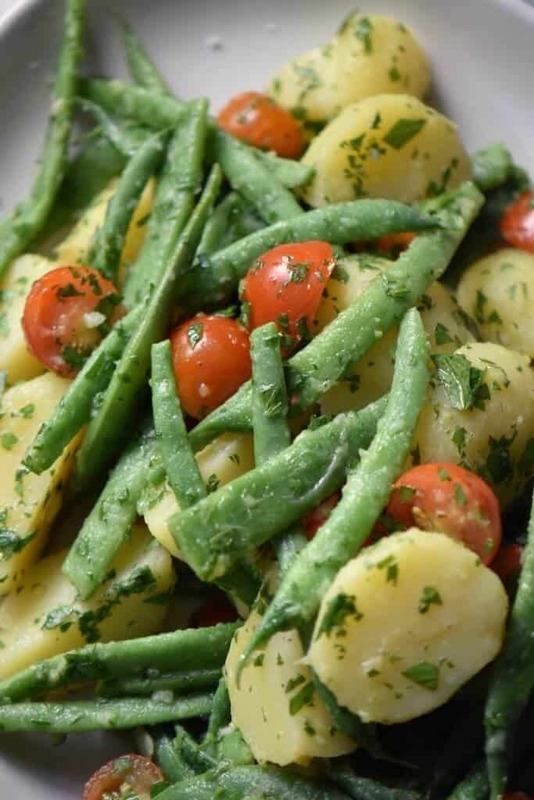 Home » Salads » Italian Potato Salad with Green Beans and NO mayo! There is no better time than right now to make this summer fresh potato salad as green beans and tomatoes are now in full swing. Without a doubt, this is the perfect potato salad! Not only is it great tasting, but it is so convenient! It can be made ahead of time and left on the counter for the flavors to develop or kept in the refrigerator and then brought to room temperature before serving. You might be surprised to learn that there is no mayonnaise in this flavorful but light tasting salad… here’s how to make it! We are going to be boiling the green beans and the potatoes in separate pots. So, let’s start by placing whole, unpeeled new potatoes in a large pot of salted cold water. Make sure the potatoes are fully immersed in the water and try to use the same sized potatoes so that they cook evenly. Bring the water to a boil, and then turn down the heat and gently simmer the potatoes for about 15-20 minutes or until they become tender. When you can easily insert the tip of a knife into the potatoes, they are done. Remember, we do not want mushy potatoes. What are the best potatoes to use for potato salad? Ideally, any potato variety that has a waxy texture works really well in potato salad recipes. Red or fingerling potatoes are some great alternatives to new potatoes. While the potatoes are simmering away, let’s bring another pot of salted water to a boil and cook the beans for about 3-4 minutes. I picked really tender green beans from my garden and so they were done in under 2 minutes. The goal is to boil (or steam) them until they become crisp tender. You can tell when they are done when they become bright green in color. This step is basically a quick blanching of string beans. 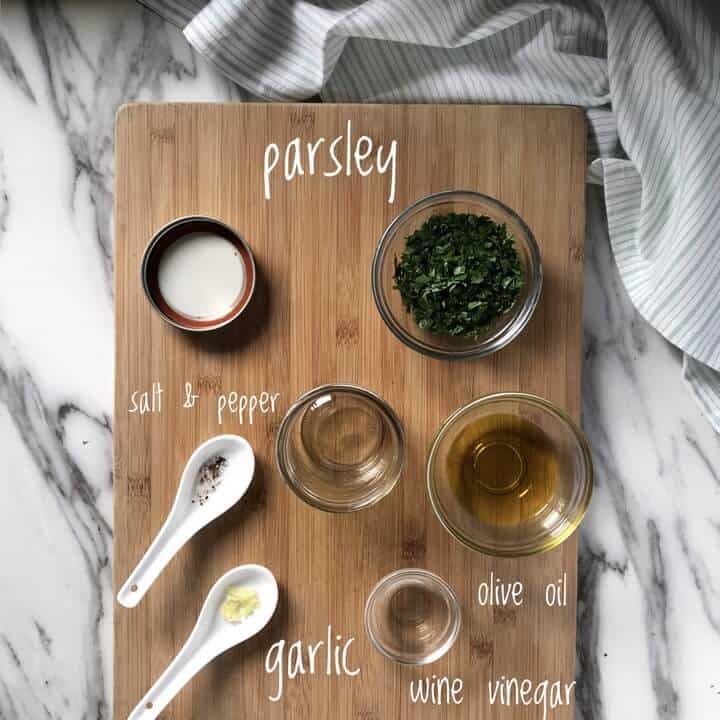 While the potatoes continue to simmer, let’s make a simple parsley vinaigrette by shaking together some olive oil, wine vinegar, minced garlic, parsley, salt and pepper together in a jar. By now the potatoes should be ready. Drain them and when they are cool enough to handle, slice in half or in quarters. You can peel off the skin at this point or just leave it on, your choice. 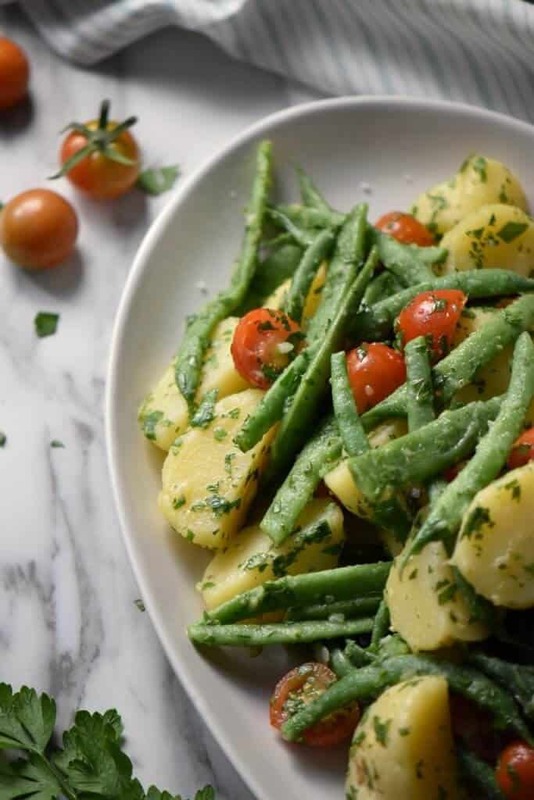 Place the warm potatoes and crispy green beans in a large bowl and toss gently together with about half of the parsley vinaigrette. Cover and allow the flavors to be absorbed for at least 5 minutes. When you are ready to serve, add the tomatoes and the rest of the vinaigrette and drizzle with the juice of half a lemon. I love to use cherry tomatoes as they provide an element of sweetness to this tasty potato salad. Feel free to use any type of tomatoes such as beefsteak, heirloom, vine, etc… These are all great options. Another reason I used cherry tomatoes is that they are plentiful in my backyard. I just can’t keep up (side note: I am not complaining 🙂 ) I’ve already made two batches of these sun dried cherry tomatoes and I have a funny feeling I need to make a few more! As with all recipes, you can easily adapt this recipe to your own personal taste. Red or green onions, celery or peppers are just some of the vegetables that you can easily incorporate in this perfect potato salad that can be enjoyed at room temperature. The same goes for the herbs. Italian flat-leaf parsley provides just the right amount of bitterness and totally brightens the overall appearance of this wonderful salad. But this salad is equally delicious with fresh basil. allow the flavors to marinate together for at least 5 minutes before serving. 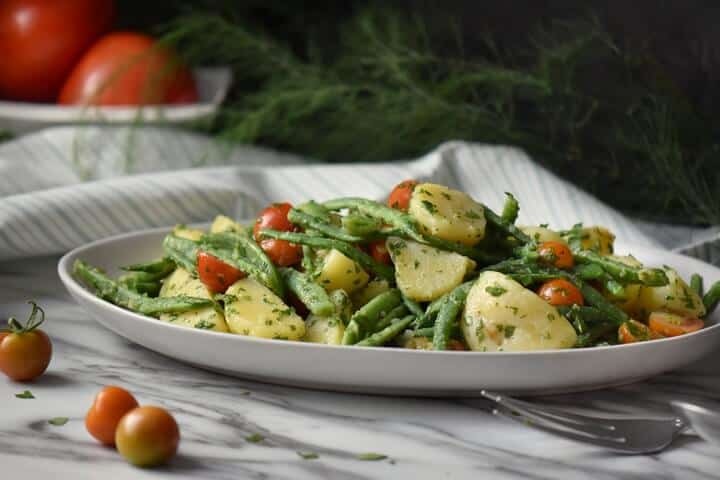 My mom would refer to this green bean potato salad as “Insalata di fagiolini e patate” and it would be made religiously, a few times a week as soon as those delicate green beans and sun-kissed tomatoes were ready to be picked from our backyard garden. As was mentioned, there are so many variations of this healthy summer salad recipe as every family put their own spin to it. The one common element is that this was definitely a no mayo potato salad. This tasty parsley potato salad makes a wonderful side dish or a nice light dinner. It’s great for potlucks and for serving a large crowd as the recipe can easily be doubled or even tripled. Fall in love all over again with garden fresh produce and make this simple Italian salad! ★★★★★ If you have made this Italian Potato Salad recipe, I would love to hear about it in the comments below and be sure to rate the recipe! In a large pot of cold water, add the potatoes and a teaspoon of salt. Bring to a boil and then reduce heat to a simmer for about 15-20 minutes or until the potatoes become tender. When a knife can easily pierce the potato, they are done. While the potatoes are simmering, bring another pot of water to boil. Add the salt. Add the string beans and blanch for about 2-3 minutes or until crisp tender and bright green in color. Drain the green beans and run under cold water to stop the cooking. While the potatoes continue to simmer, combine the ingredients to make the parsley vinaigrette in a small mason jar. Place the screw-top cap and shake together. Drain the potatoes and when cool enough to handle, slice them in half or in quarters. 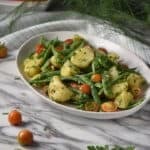 Place the warm potatoes and crispy green beans in a large bowl and toss together with about half of the parsley vinaigrette. Allow the flavors to be absorbed for at least 5 minutes. When ready to serve, add the tomatoes and the rest of the vinaigrette and drizzle with the juice of half a lemon. Made this tonight, but really went all out with the add-ins to make it more of a vegetarian main dish. I added red onion, cucumber, yellow bell pepper, kalamata olives & feta cheese. With the leftovers for lunch tomorrow, I’m also topping with a sliced boiled egg. Awesome recipe & definitely a go-to year round. That sounds absolutely delicious Dax! Thanks so much for sharing 🙂 It’s winter right now where I’m at but this green bean salad is something that happens at least once a week as soon as I am able to pick my backyard green beans. Appreciate you taking the time to comment. Have a great day! 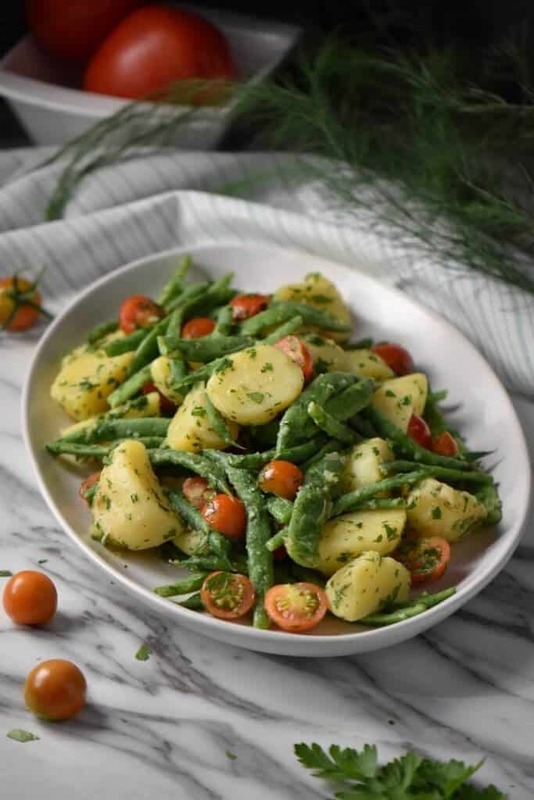 Oh my, what a flash back, when growing up on a farm in Calabria, me & my grandma, used to pick fresh string beans & tomatoes, as well as the potatoes & garlic. And we would pick, sort & clean the fresh veggies and my grandma would show me how to make the most amazing veggie recipes. Your recipe bought me back to the farm picking the veggies. It bought tears and a very warm, loving feeling in my heart & soul, Thank you for sharing your recipes. I will definitely be looking at some of your great looking recipes, and making them. GRAZIE!!! It never seizes to amaze me how food can trigger so many memories. Thanks for sharing Patrick. I also have some fond memories with this Italian Potato Salad. Thanks for taking the time to comment. Maria, I love anything with those wee new potatoes. Just pressed print and looking forward to trying this. Lately I have had to be careful consuming things that are acidic, so a dressing with only 2 TB of vinegar – has my vote!! I make this salad all through summer. However, I don’t like parsley. Instead, we use oregano. Tastes so fresh. This is one thing about summer I love. That salad is similar to what I grew up with – no mayo – although my mom never added the green beans and tomatoes. I love those additions however and will try it. Your photos are mouth-watering.